When our eavestrough company cleans your eavestroughs, our skilled technicians take every measure to ensure your home receives the best protection. We use covered ladders that won't damage your roof and we clean your eavestroughs manually instead of using power washers that might loosen or damage the eavestroughs and downpipes. 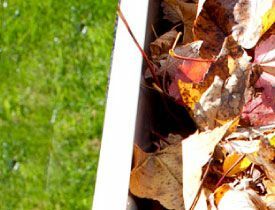 Every eavestrough cleaning from Toronto Eavestrough Cleaning Masters also includes downspout cleaning to ensure that water is directed away from the house. When our team is finished cleaning the eavestroughs and unclogging the downpipes, we collect all the debris in bags so we leave your property looking its best. Our professional eavestrough cleaning team will inspect and offer you a full report on the condition of your roof and eavestroughs. Unlike many roofing companies which subcontract the eavestrough maintenance to others and prioritize new roof installations, our technicians clean your eavestroughs and, after a thorough inspection, recommend any repairs or preventive measures necessary to prolong the life of your roof and eavestroughs. Toronto Eavestrough Cleaning Masters will safeguard your house from water damage due to overflowing, leaking, dripping, loose and damaged eavestroughs or downpipes. You don’t ever have to worry about your eavestroughs again. Many eavestrough problems begin with poor installation that is unsuited to the slope and overhang of your shingles and are then exacerbated by lack of maintenance. Ask us about leaf guard systems to screen debris from clogging your eavestrough or downpipe. We have researched the most effective and affordable eavestrough manufacturers and leaf guard systems and will ensure that they work correctly with your roof. 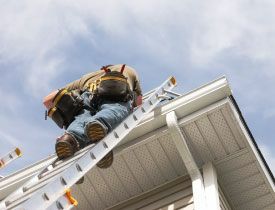 By working with Toronto Eavestrough Cleaning Masters, you can avoid the risk of personal injury due to unstable roofing elements and slippery ladders. We are licensed, insured and experienced. Now, isn’t it time to call Toronto Eavestrough Cleaning Masters to schedule your eavestrough inspection and cleaning?